North Korea launched a rocket at 9:30 a.m. Sunday, South Korea’s Yonhap News Agency reported, citing the South Korean Joint Chiefs of Staff. The three-stage rocket, or space launch vehicle, was launched from the Sohae Satellite Launching Station (a.k.a. Tongchang-ni) in North Pyongan Province on the country’s west coast. The rocket likely was carrying a Kwangmyongsong satellite which Pyongyang was attempting to place in orbit. The Japanese government was quoted by NHK as saying that the rocket passed over Japanese territory near the island of Okinawa, in the Ryukyu Island chain. According to the Japanese government, three objects from the rocket have fallen into the sea. The first stage fell in the Yellow Sea about 150 kilometers west of the Korean Peninsula. The second object, likely the fairing between the first two stages, fell in the East China Sea about 250 kilometers southwest of Korea. The second stage of the rocket splashed down in the Pacific Ocean, about 2000 kilometers from Japan, at 9:45 a.m. Korea time. The launch caused no damage to any vessels or flights, according to South Korea’s Ministry of Land, Infrastructure and Transport and Ministry of Maritime Affairs and Fisheries, Yonhap reported. North Korea had announced on the day before that the launch window for the rocket had been moved up from February 8-25 to February 7-14. North Korea conducted on the launch on the first morning of the new launch window. According to Yonhap, the weather at Tongchang-ni today is clear with little wind. Chris Green, a Ph.D candidate at the University of Leiden, echoed that the change in timing was likely due to Sunday’s favorable weather conditions in Korea. “Propaganda and brinksmanship are both important, but even they are beholden to logistics,” he said. 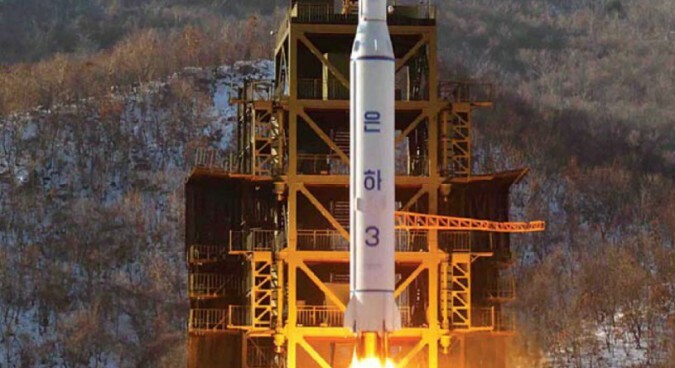 This is North Korea’s fifth attempt to launch a satellite into orbit. The country conducted previous launches in 1998, 2009 and twice in 2012. Another test-launch in 2006 of the Unha-1 rocket did not carry a satellite. The previous launch in December 2012, was successful in placing the Kwangmyongsong-3 Unit-2 satellite into orbit, though not a stable one. Pyongyang has not yet publicly confirmed the launch. The Sunday edition of the Rodong Sinmun, the official paper of the ruling Workers’ Party of Korea, made no mention of the launch. Because launches are dependent on favorable weather conditions, the writers of Rodong would not have known ahead of time of the exact time and date. Neighboring countries, though, have begun reacting. The Minjoo Party, South Korea’s largest opposition party, also spoke out against the North’s action. At least one expert believes that, despite the launch, North Korea is not yet a true nuclear power. “This seems like it’s for domestic use, to boast Kim Jong Un’s contribution to national security, following the nuclear programs of the former leaders. North Korea will propagate that they achieved security, and they achieved superiority for the peace treaty negotiations with the U.S.,” Park Sun-won, Ph.D. and former secretary to President Roh Moo-hyun for National Security Strategy, told NK News. “(The) core point is, whether North Korea is able to use the solid fuel and a mobile launcher. They have not equipped these yet, as far as is known. Without this capacity, North Korea is not a nuclear state, as it doesn’t have second(-strike) capability (to counter-attack),” Park added. “Therefore, the U.S. will strengthen sanctions, to hit the regime before it has fully equipped the capacity. The U.S. will press China, and China is likely to follow the U.S. and not expand the conflict between the U.S. from the South China Sea to the northeast regions,” said Park. Another expert, however, says the launch could be considered threatening to the South. “They succeeded in their first stage and the second stage of the rocket launch, thus we can can say the launch itself was successful,” Kim Dong-yup, researcher at the Institute for Far Eastern Studies, told NK News. This launch comes in the wake of North Korea’s fourth nuclear test on January 6. Following international condemnation for the test, Pyongyang announced on February 2 its plan to conduct a satellite launch. North Korea maintains its space program is for peaceful purposes.